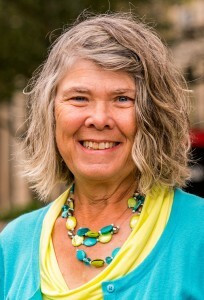 Barbara Andereck specializes in theoretical solid state physics. Her research interests include archaeoastronomy of the Four Corners region; synchronization of mechanical oscillators; and phase transitions in liquid crystal systems, especially the nematic to smectic A transition. She also is interested in working to enhance the teaching of physics and astronomy at the secondary and undergraduate levels and has created worksheets and other materials to assist teachers in this arena. Recently she wrote a supplementary text for sophomore-level physics titled Underlying Physics. Since 2006 Andereck has been involved with Assessment and Accreditation at Ohio Wesleyan as an Associate Dean of Academic Affairs. Her interests and responsibilities have broadened to include pedagogical issues. She is also a Consultant Evaluator for the Higher Learning Commission of the North Central Association. “The Magic Magnifier,” Barbara S. Andereck and Sherri Secrest, The Physics Teacher, 39, 301, 2001. “Measurement of Air Resistance on an Air Track,” Barbara S. Andereck, American Journal of Physics, 67, 528, 1999. “Anisotropy of the Nematic-Smectic-A Phase Transition,” Barbara S. Andereck, Liquid Crystals in the Nineties and Beyond, Satyen Kumar, ed. World Scientific, 1996.